I told myself that I did not need this bag. Repeatedly. Yet here I am, blogging my endearment. I'm officially adding this to my birthday wishlist. I saw this bag a couple years ago and instantly fell in love. It's surprising that I've been able to stay away for this long. The main reason is because I was waiting for a specific size to become available. 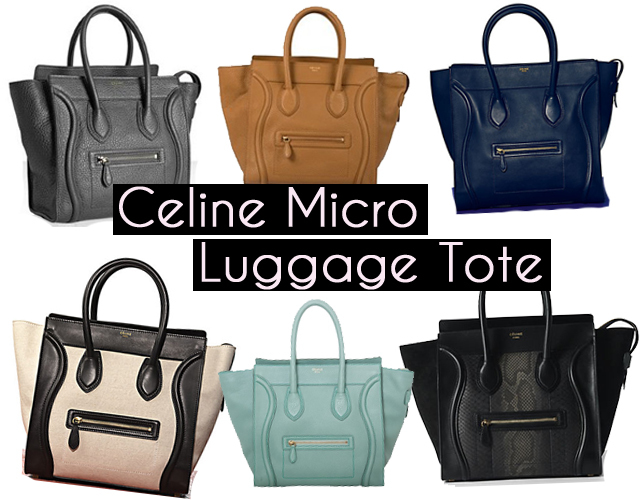 The fabled Celine Micro Luggage Tote. There's the Mini and the Nano, but I had my eyes set on something in the middle. I tried the Mini but it was too large for my liking. The Micro is the perfect size at 10″H x 10″W x 6″D. Celine comes out with beautiful colours, patterns, and textures but I'm just looking for something boring, yet classic. Sand beige (Dune) or Black is more my speed. It's a bag that I know I will use for a long time. They're a little difficult to find here, though. If you're in Canada, you can find them at Holt Renfrew (although, there's a long waitlist). Also, if you're in the GTA, you can find Celine at 119 Corbo in Yorkville. I am curious how to do have money to buy those expensive bags? I am a student, I am work full time & I am still broke. I have wanted to buy a balenciaga forEVER. I settled on a couple fake ones. haha. Balenciaga makes gorgeous bags! I would love to have one in every colour lol.